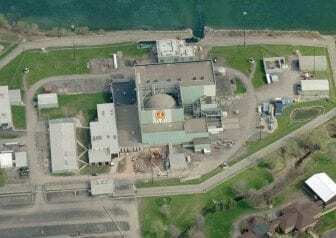 ROCHESTER, NY (WXXI) – The Ginna Nuclear Power Plant in Wayne County is partially back on line. As WXXI News reported last week, the plant had to be taken off-line last Thursday due to an electrical problem off site, at a nearby RG&E transformer. A spokesman with the Nuclear Regulatory Commission, John Sheehan, says the plant was brought back on line Saturday, but there was a problem with an indicator for a control rod. Sheehan says an NRC inspector who is stationed at Ginna has been supervising the repair work. Right now Ginna is at 74 percent of its power, but a spokeswoman for Exelon Corp. which operates the plant, says that is not causing any issues with area electrical service. There’s no word yet when the plant will be back to full power.